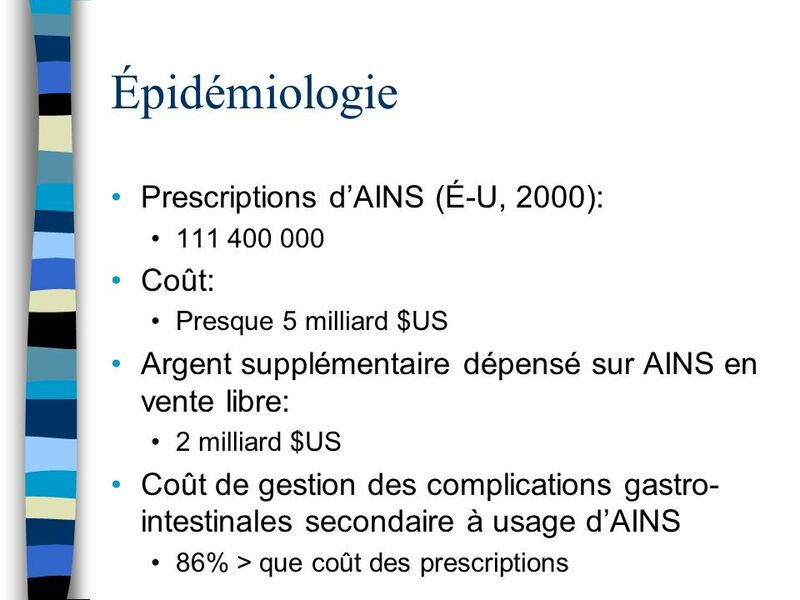 Coût: Presque 5 milliard $US Argent supplémentaire dépensé sur AINS en vente libre: 2 milliard $US Coût de gestion des complications gastro-intestinales secondaire à usage d’AINS 86% > que coût des prescriptions Two main factors in the economic impact of GI complications secondary to NSAID use are the cost of hospitalisation and the cost of prevention. 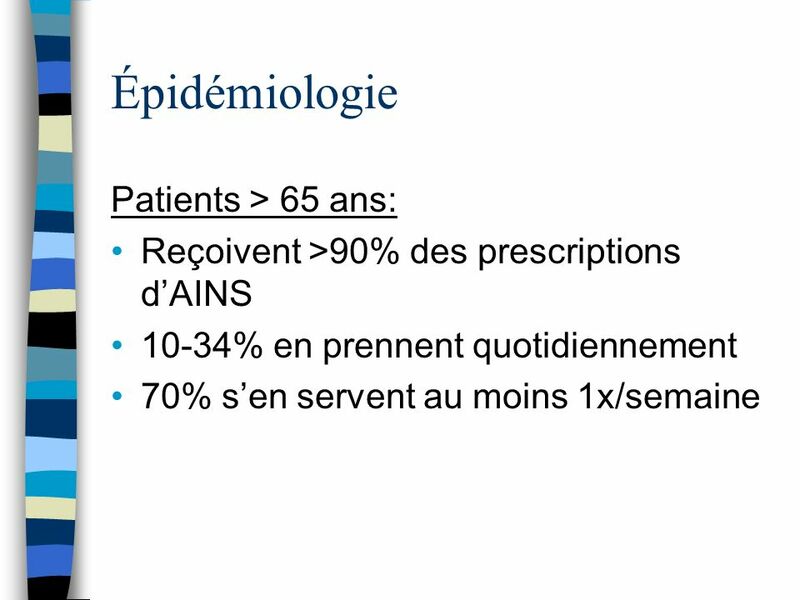 When these indirect costs are taken into account, the total cost of NSAID use is 86% greater than the actual cost of the NSAID prescription. 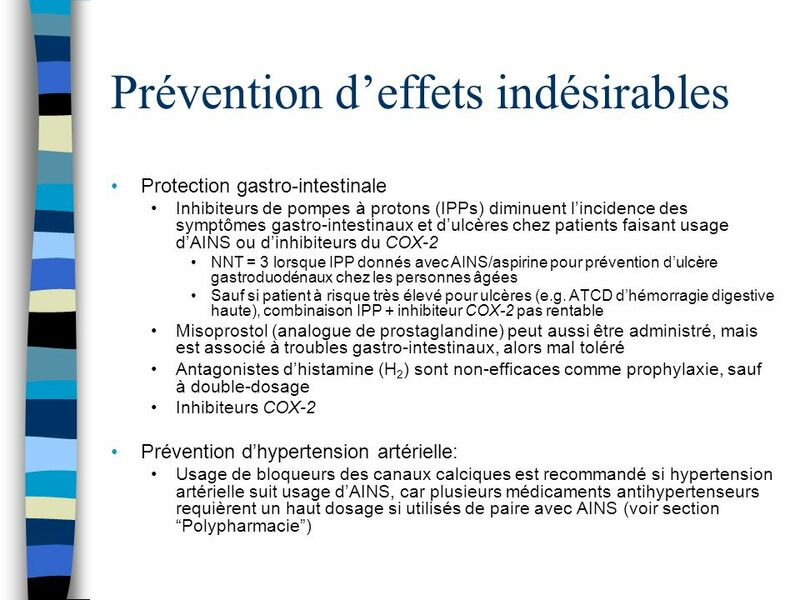 Inhibition COX-1 mène à inhibition de la production de la prostaglandine H2 + thromboxane A2 (TxA2) + prostacycline (PGI2) TxA2 joue un rôle pour l’agrégation des plaquettes; TxA2 produite par plaquettes PGI2 joue un rôle dans la vasodilatation et dans l’inhibition de l’agrégation des plaquettes t1/2: 15 minutes Mature platelets lack the ability to synthesize new COX-1, and thus fully functional platelet activity depends on replacement of platelets by new one (t1/2 of platelets: 4 days); thus, we advise patients to discontinue use of aspirin 1 week prior to surgery, to allow a sufficient number of functional platelets to be present. 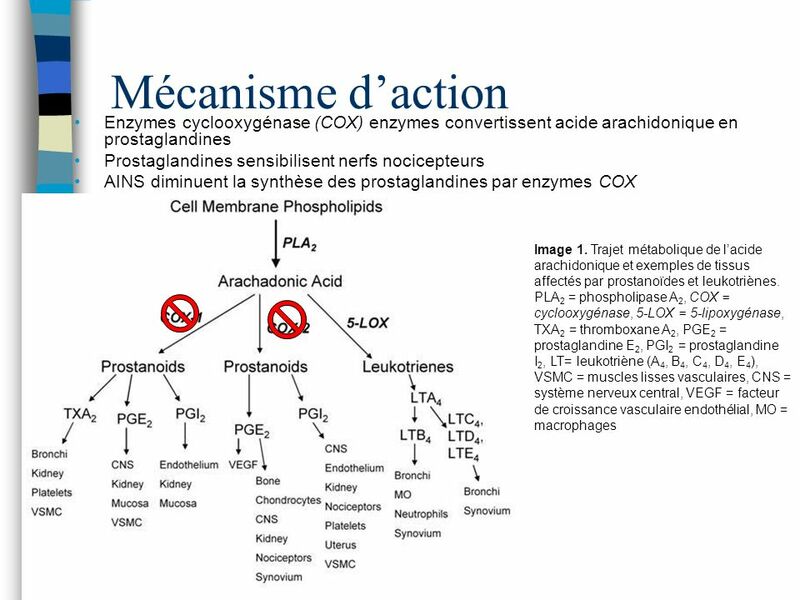 However, endothelial cells have the ability to regenerate COX-1, and thus the net effect of inhibition of prostacyclin (PGI2) production is less significant than inhibition of TxA2 production. 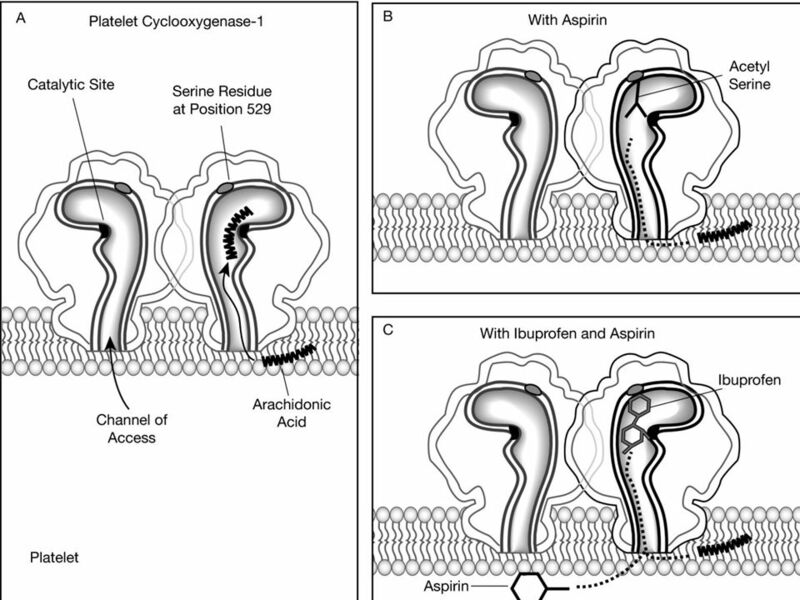 Aspirin also reduces endothelial cell production of prostacyclin (PGI2), an inhibitor of platelet aggregation and a vasodilator. 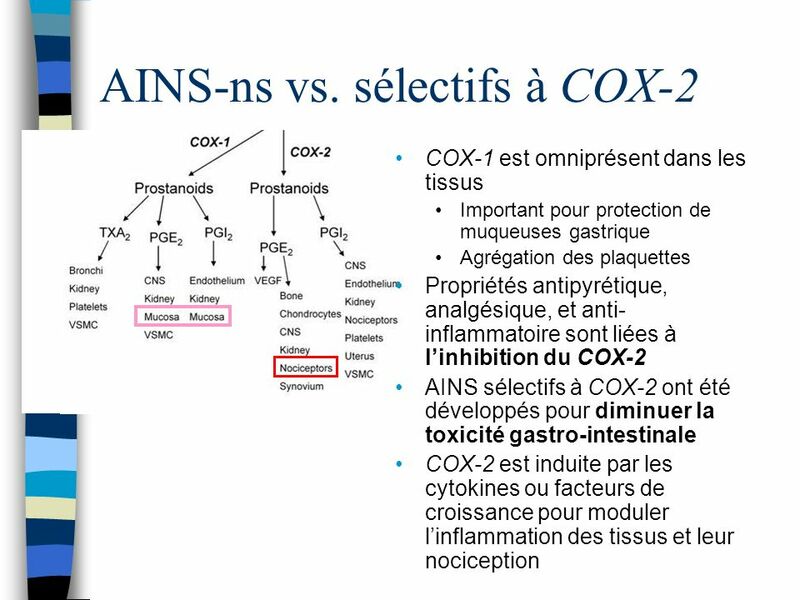 Localized to the site of coagulation is a balance between the levels of platelet derived TxA2 and endothelial cell derived PGI2. 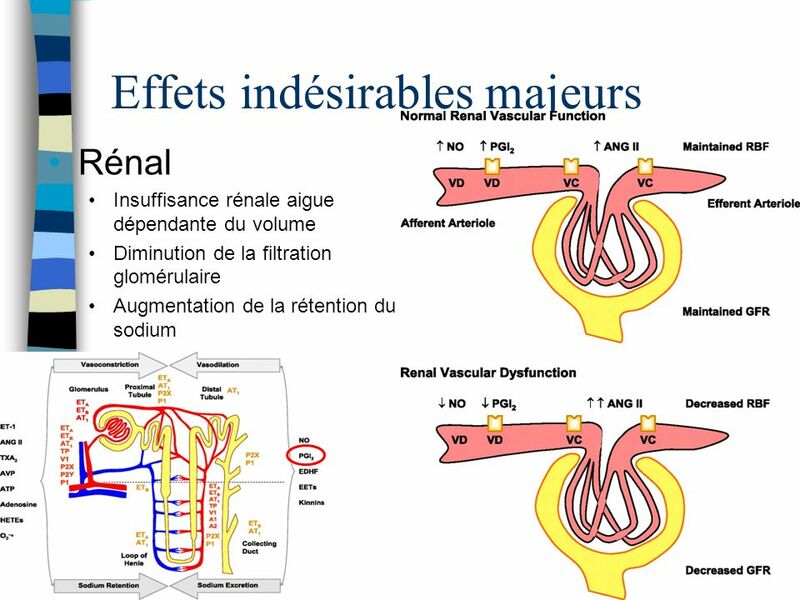 This allows for platelet aggregation and clot formation but preventing excessive accumulation of the clot, thus maintaining blood flow around the site of the clot. 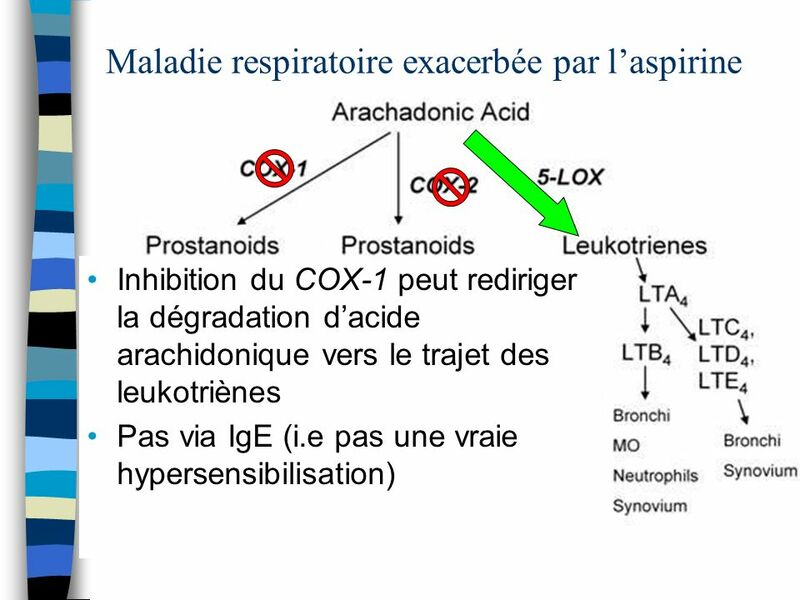 Endothelial cells regenerate active COX faster than platelets because mature platelets cannot synthesize the enzyme, requiring new platelets to enter the circulation (platelet half-life is approximately 4 days). 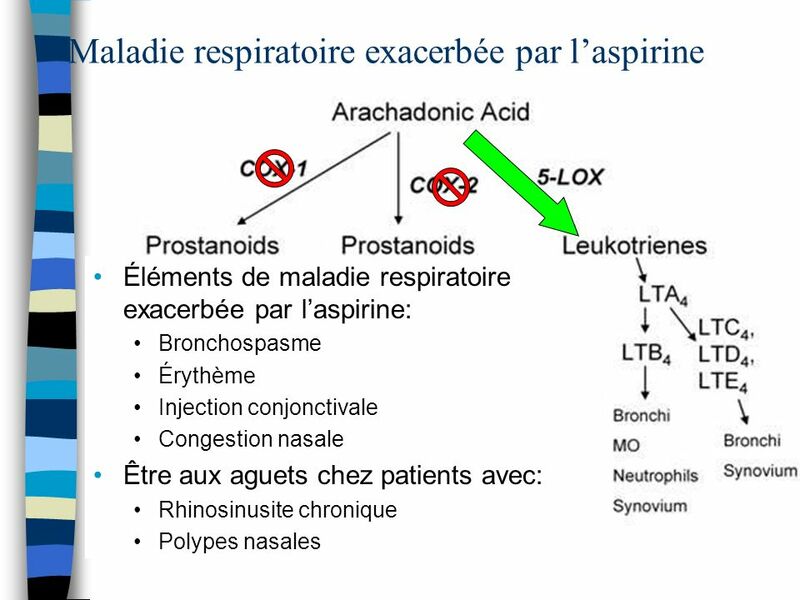 Therefore, PGI2 synthesis is greater than that of TxA2. 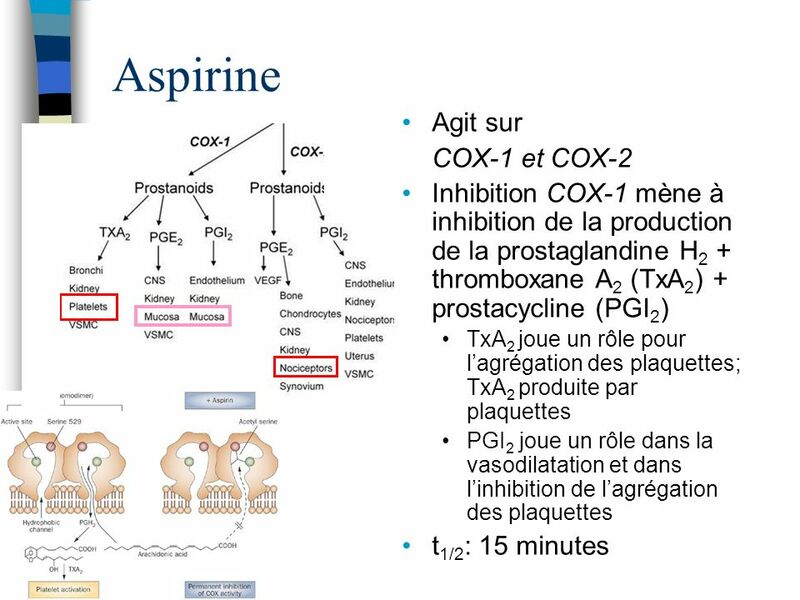 The net effect of aspirin is more in favor of endothelial cell-mediated inhibition of the coagulation cascade. 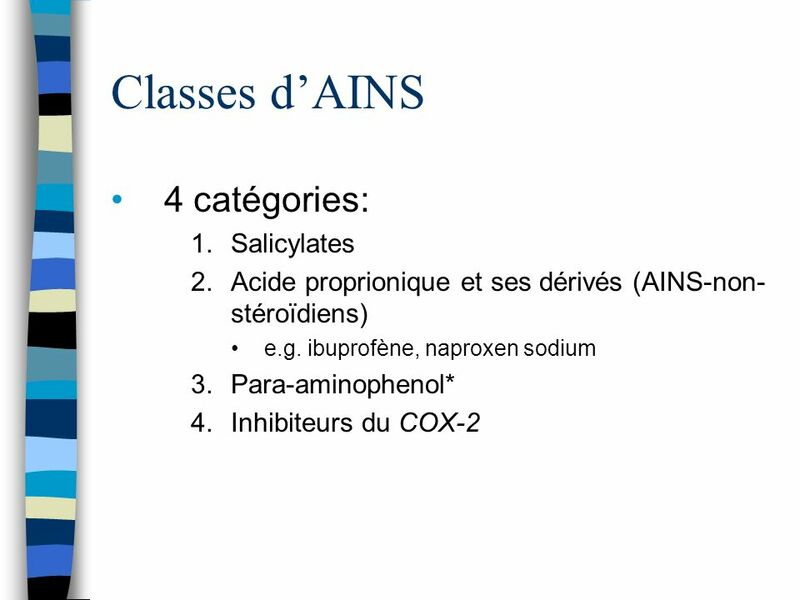 11 Acetyl group forms covalent bond with serine 529 (located adjacent to catalytic site, but not within it), resulting in irreversible inhibition of COX-1. 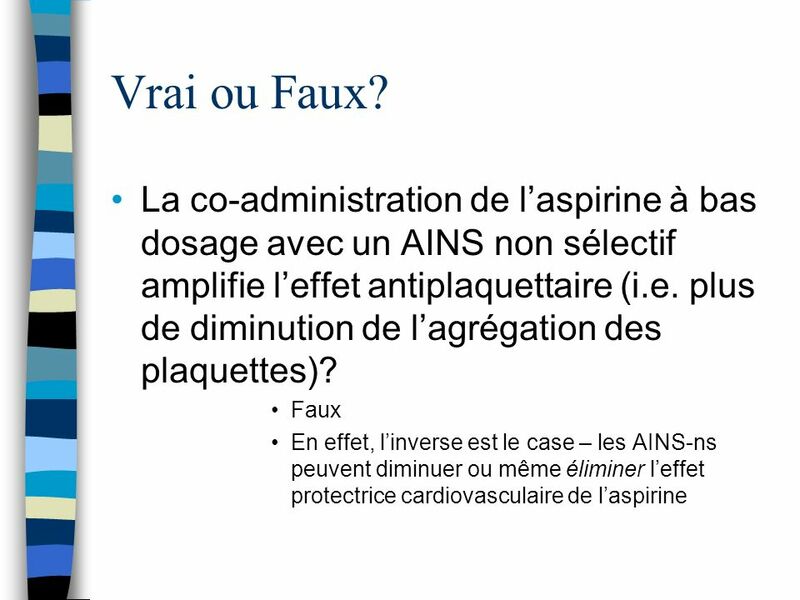 Ibuprofen and other ns-NSAIDs (ns = non-selective) bind reversibly to the residue, and thus can be eliminated, eradicating significant inhibition of platelet TxA2 and thereby permitting unimpeded platelet aggregation. 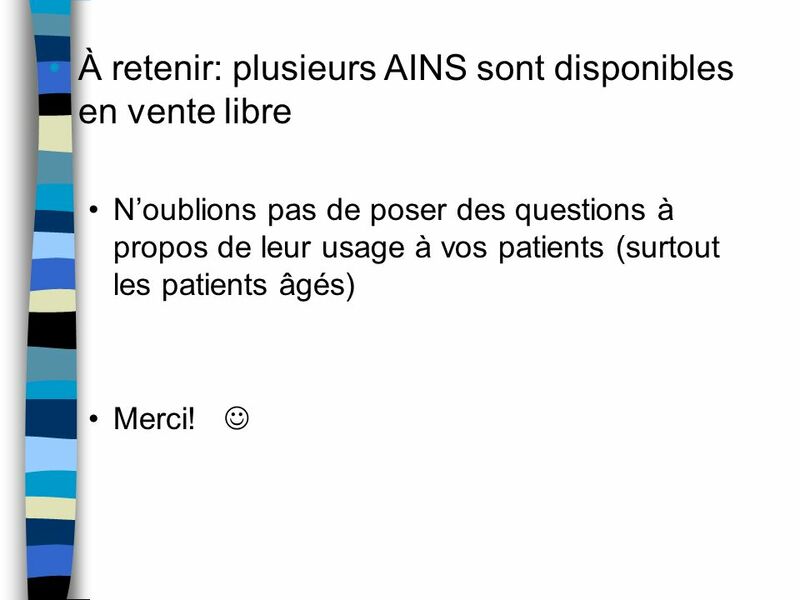 Serum half-life of aspirin: 15 minutes; ibuprofen: 2 hours. 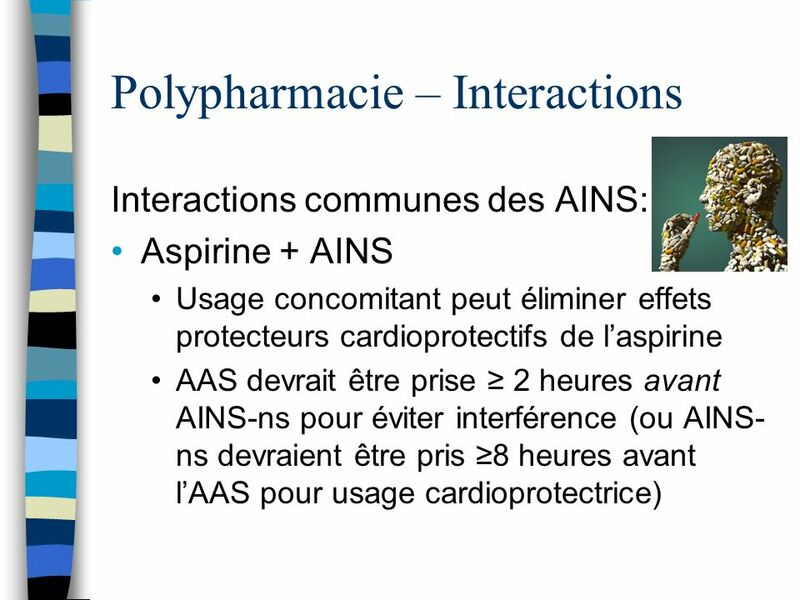 Therefore, if both drugs are co-administered, the ibuprofen may bind to serine 529 (reversible inhibition), interfering with aspirin binding to the site (irreversible inhibition). 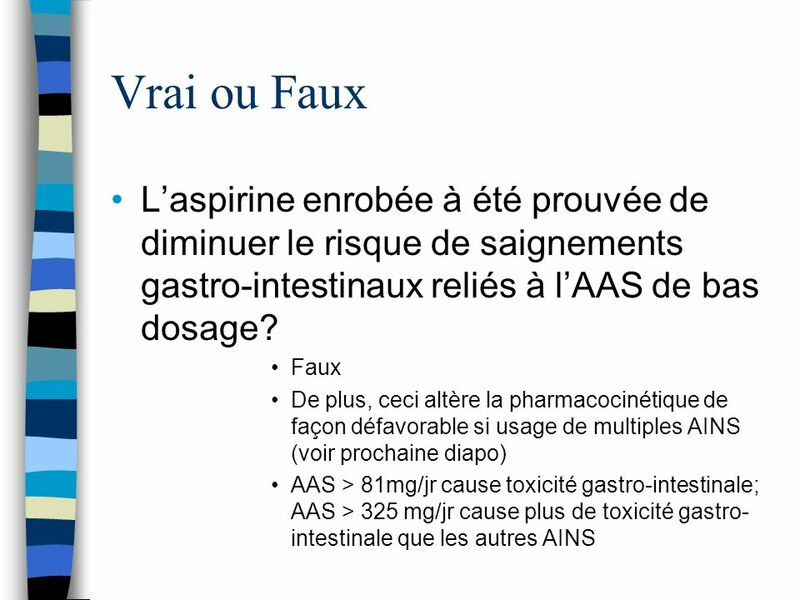 Aspirin is excreted (shorter half-life), and when ibuprofen unbinds, there lacks the presence of the expected aspirin-mediated irreversible inhibition of TxA2 is no longer present. 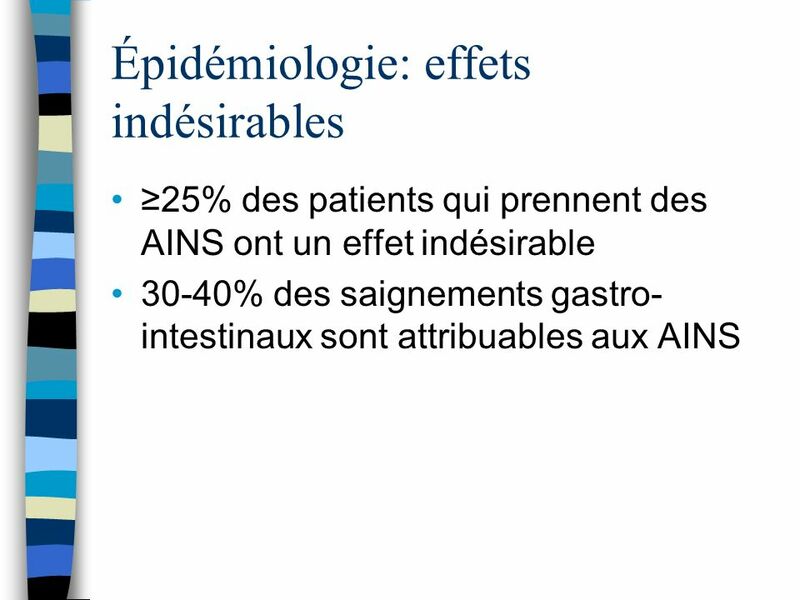 Protection gastro-intestinale Inhibiteurs de pompes à protons (IPPs) diminuent l’incidence des symptômes gastro-intestinaux et d’ulcères chez patients faisant usage d’AINS ou d’inhibiteurs du COX-2 NNT = 3 lorsque IPP donnés avec AINS/aspirine pour prévention d’ulcère gastroduodénaux chez les personnes âgées Sauf si patient à risque très élevé pour ulcères (e.g. 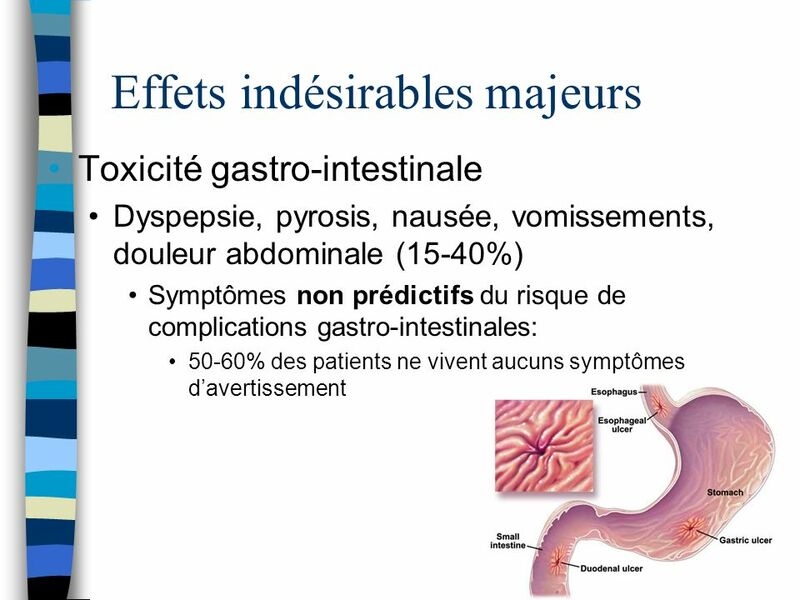 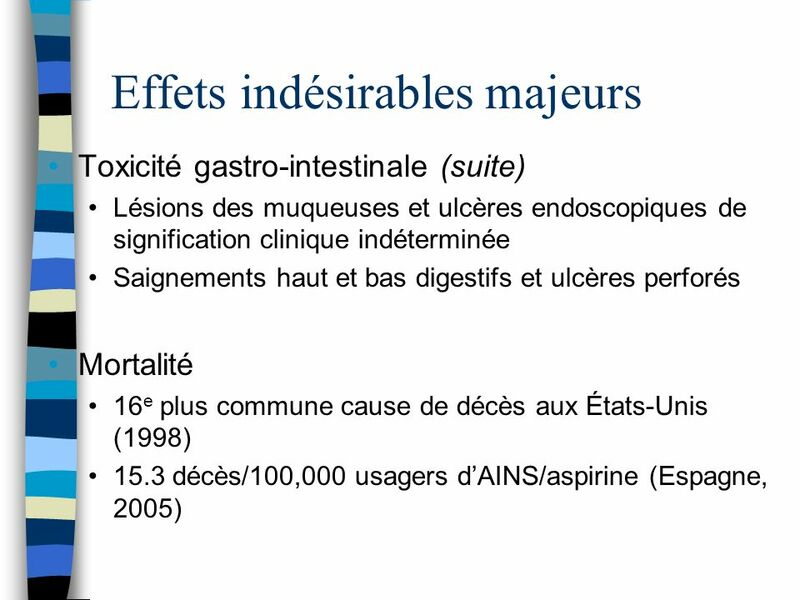 ATCD d’hémorragie digestive haute), combinaison IPP + inhibiteur COX-2 pas rentable Misoprostol (analogue de prostaglandine) peut aussi être administré, mais est associé à troubles gastro-intestinaux, alors mal toléré Antagonistes d’histamine (H2) sont non-efficaces comme prophylaxie, sauf à double-dosage Inhibiteurs COX-2 Prévention d’hypertension artérielle: Usage de bloqueurs des canaux calciques est recommandé si hypertension artérielle suit usage d’AINS, car plusieurs médicaments antihypertenseurs requièrent un haut dosage si utilisés de paire avec AINS (voir section “Polypharmacie”) Note: GI ulcer scars rely on induced COX-2 to maintain integrity; thus ns-NSAIDs and COX-2 inhibitors increase the risk for GI bleeding. 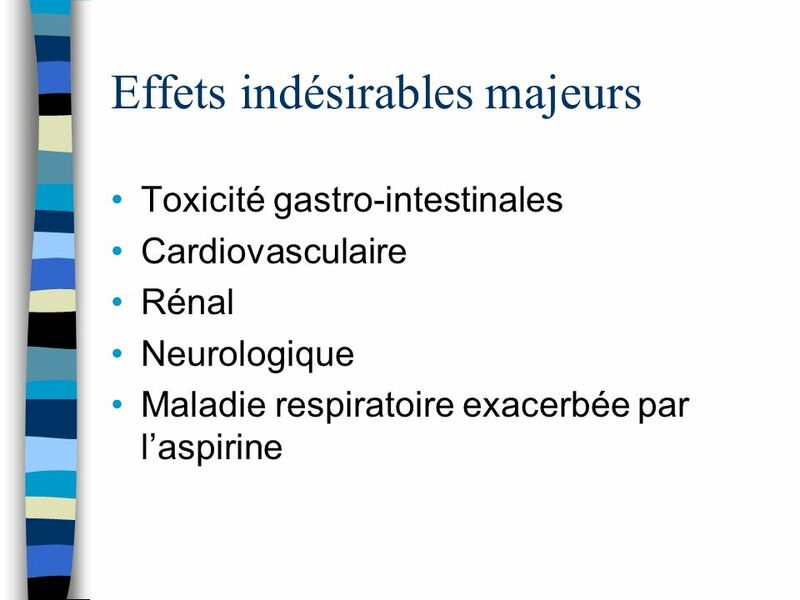 Diminue l’effet antihypertenseur des: β-bloqueurs, ARAs, diurétiques, bloqueurs α T.A. 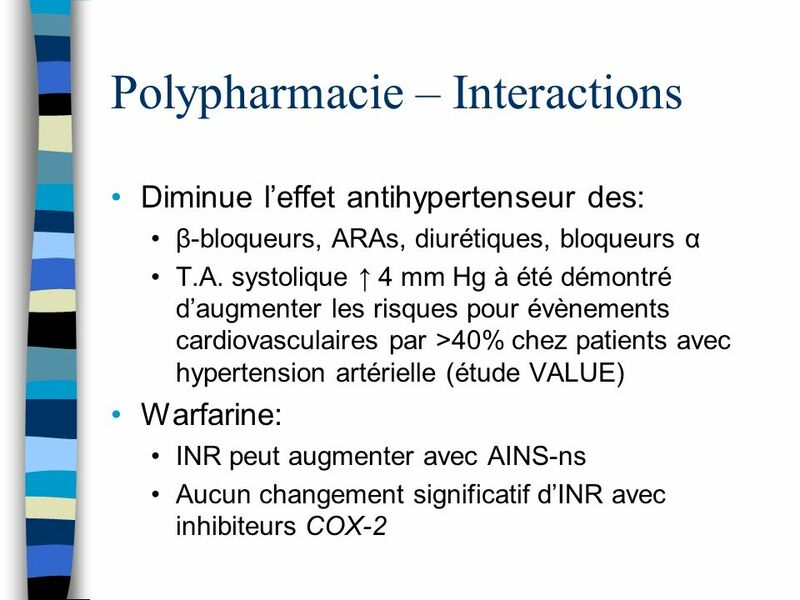 systolique ↑ 4 mm Hg à été démontré d’augmenter les risques pour évènements cardiovasculaires par >40% chez patients avec hypertension artérielle (étude VALUE) Warfarine: INR peut augmenter avec AINS-ns Aucun changement significatif d’INR avec inhibiteurs COX-2 Patients with pre-existing hypertension should have careful BP monitoring when taking nonaspirin NSAIDs, including COX-2 inhibitors, especially within the first 3 months of the start of treatment with NSAIDs. 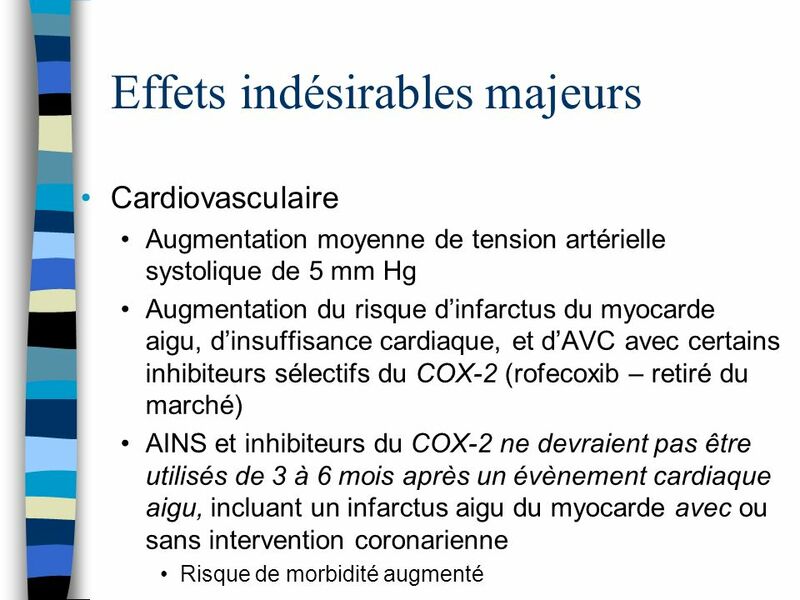 Normotensive individuals with multiple CV risk factors or histories of CV events should have close BP monitoring for >= 2-4 weeks after starting COX-2 inhibitors ns-NSAIDs and, even if there is no increase in BP, at least every 3 months thereafter. 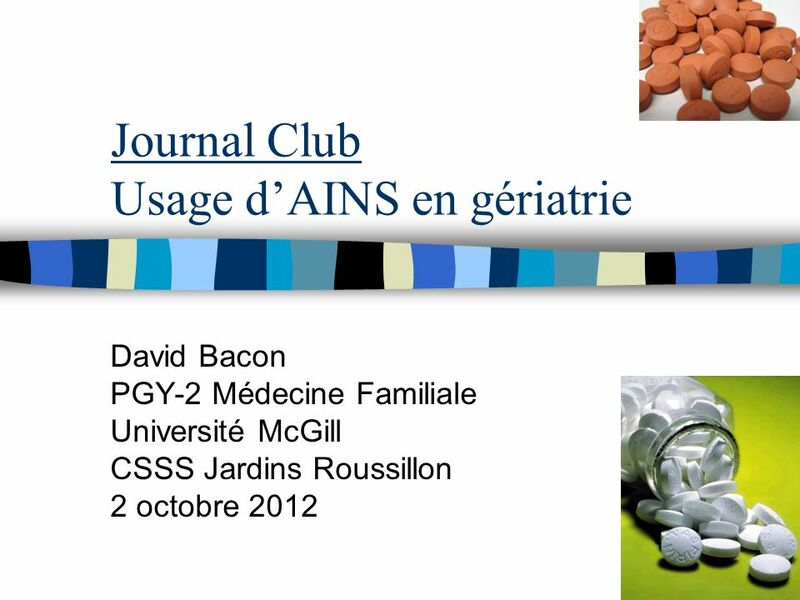 Self-monitoring of BP should be encouraged in patients with CV disease who are taking NSAIDs. 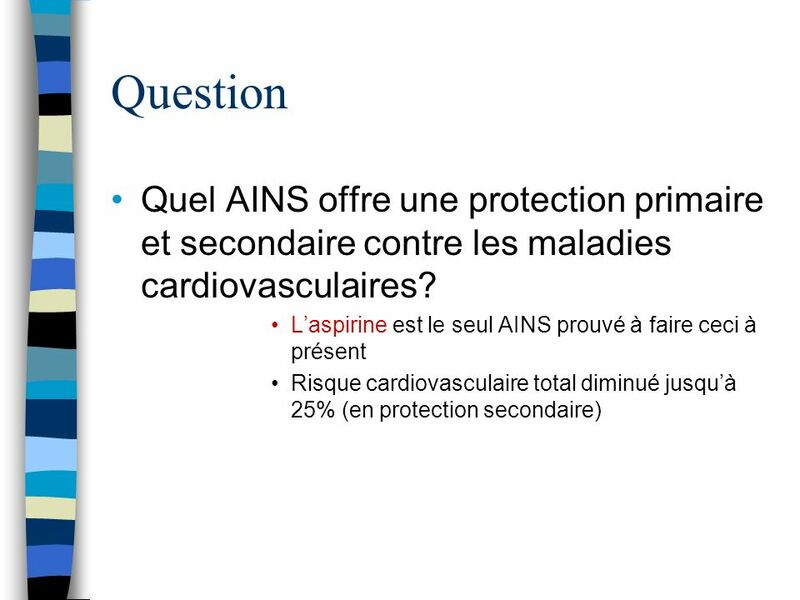 Patients with CV disease who develop hypertensions after starting NSAIDs, as the first step in BP control, should discontinue the NSAIDs or decrease the NSAID doses. 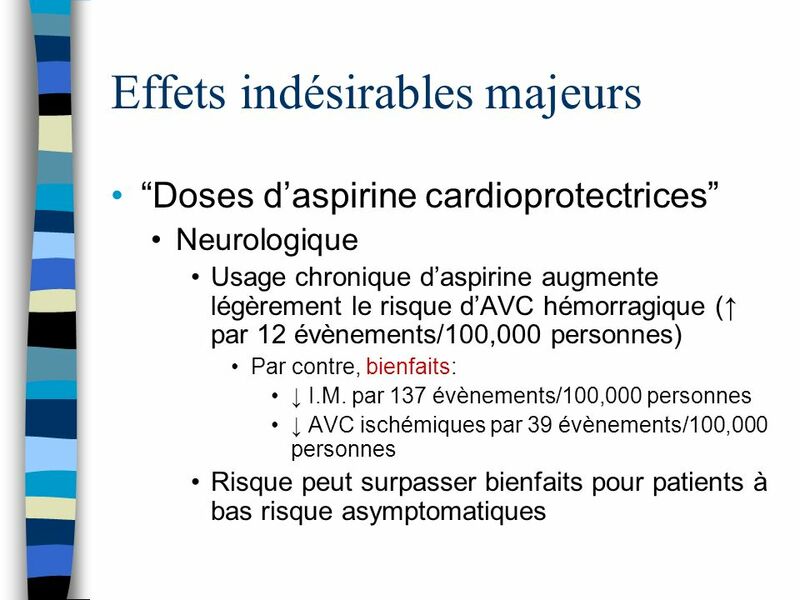 Patients developing hypertension on NSAIDs should receive antihypertensive pharmacologic treatment when NSAID discontinuation is not possible or dose reduction is ineffective or is not feasible. 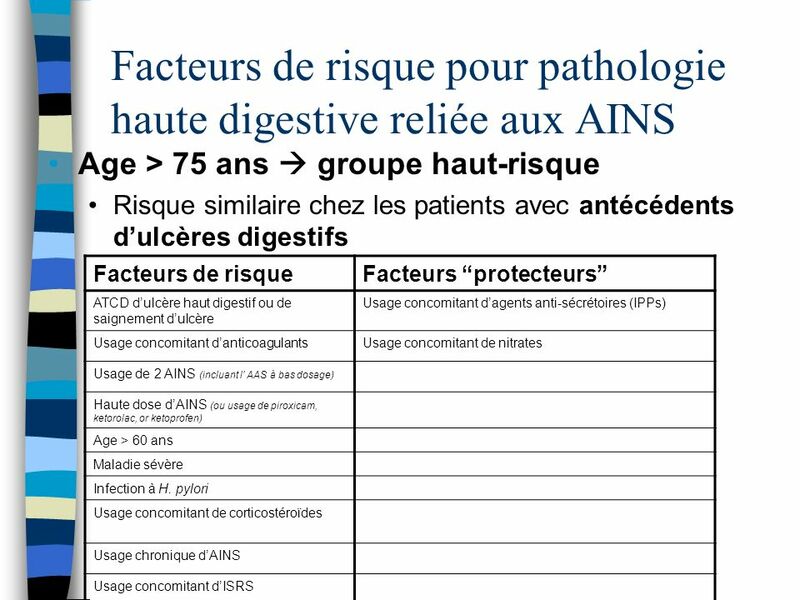 As with addition of other medications to stable anticoagulation regimens with warfarin, INR should be monitored over the first few weeks after adding NSAIDs to a regimen. 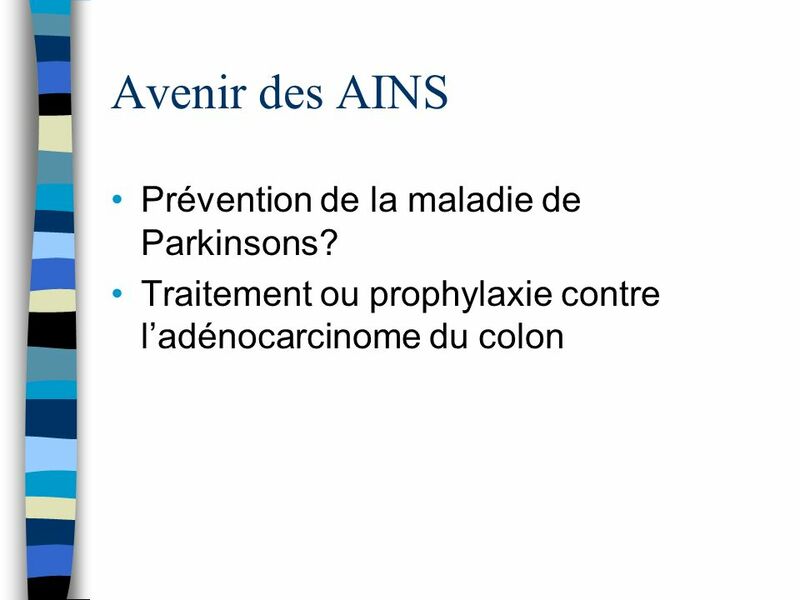 27 Avenir des AINS Prévention de la maladie de Parkinsons? 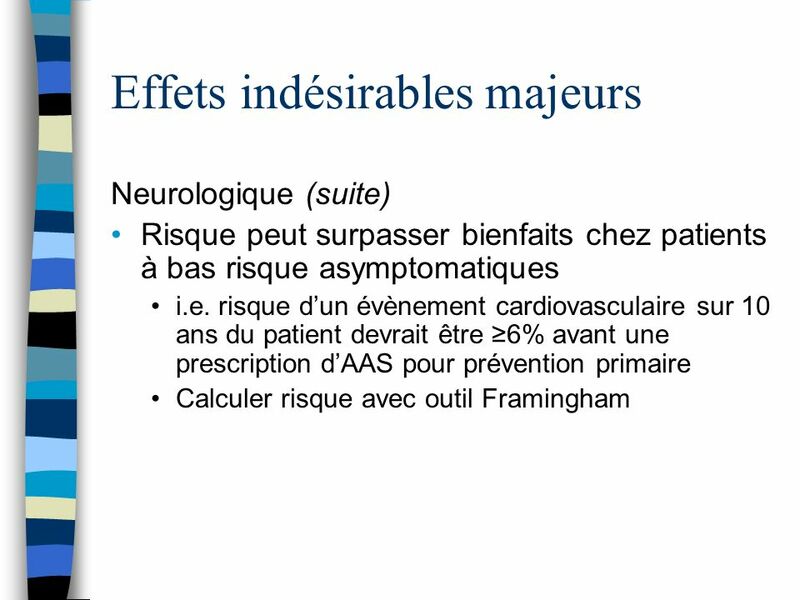 Télécharger ppt "Journal Club Usage d’AINS en gériatrie"
Contrat damélioration des pratiques individuelles Les indicateurs et les niveaux cibles. 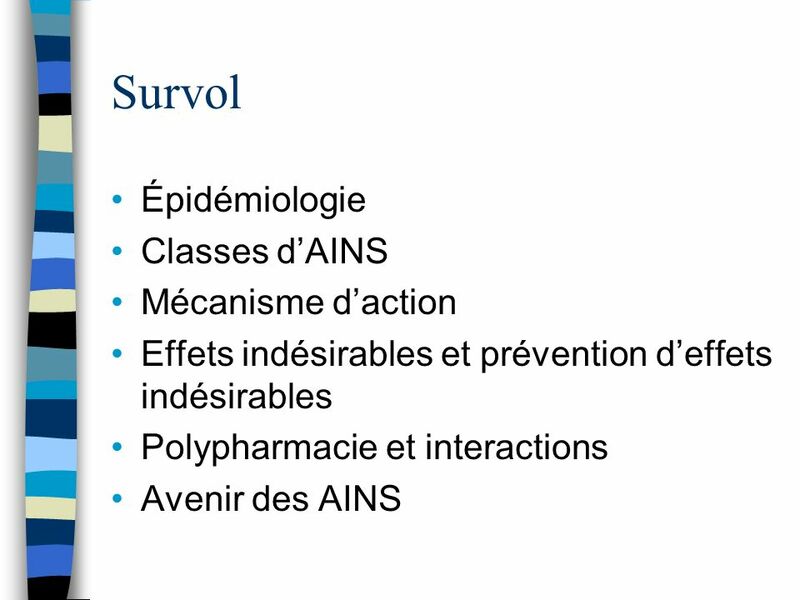 CAS CLINIQUE (1) AUTOMEDICATION Facultés de Médecine Toulouse DCEM4 Module 11 Thérapeutique Générale 2011 – 2012 Service de THERAPEUTIQUE.